Estate Ammunition is part of the largest network of companies in the ammunition world: the Vista Outdoor Brand umbrella which was once under the ATK (Alliant TechSystems) corporate flag. They are a well-run company and have a huge network of support for their products, including R&D, component production and sourcing, and marketing channels. This is not a tiny brand that is barely getting by. 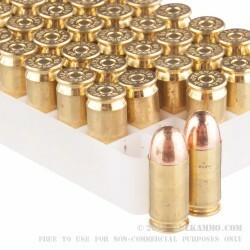 It goes without saying, that with the stable of products and brands in that umbrella, and the corporate oversight and interconnectedness of Vista Outdoor: Estate Ammunition is producing top quality ammunition. 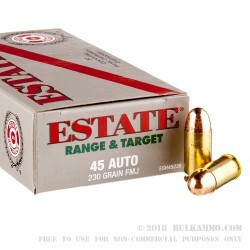 This is a pistol product that is squarely in the Estate Ammunition sweet spot: it is a straightforward 45 ACP target round that is in an easily digestible format and offers great reliability while offering a very nice price of entry. 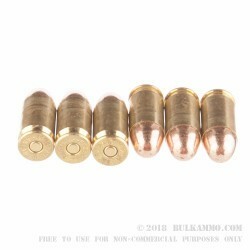 This “hardball” load is great for functionality, it offers a good balance of a large projectile, great reliability, moderate recoil and relatively clean operation. The powder is higher quality than most other loads at this price, and the cost is very competitive with even “range reloads”, so you know you are getting a bargain. The cases are reloadable thanks to the premium brass build and the Boxer primer.